The Church has to be pastoral, reaching out to everyone, with the proclamation of the love of God a priority rather than small minded rules, Pope Francis said in an interview published on Thursday. The 10,000 word interview by Fr Antonio Spadaro, SJ was conducted over three sittings with Pope Francis and was published in the Jesuit magazine America and La Civilta Cattolica. The interview touched on personal issues: how Pope Frances sees himself (“a sinner whom the Lord has looked upon.”), his attraction to community and people (“I cannot live without people. I need to live my life with others.”), his desire for consultation (“I do not want token consultations, but real consultations. ), his admiration for the ‘common’ sanctity visible in the “patience of the people of God” and his desire for the church to accompany all people with mercy. The Pope revealed to Fr Spadaro that the element of Ignatian spirituality that helps him most in his papacy is discernment. In the past he had rushed into decisions but had grown over time to appreciate the value of patience, and of consulting with others. As Archbishop of Buenos Aires, he met the auxiliary bishops every two weeks, and his priests several times a year. “I do not want token consultations, but real consultations,” he said. The synods and consistories were important places of real consultation but needed to be “less rigid”. 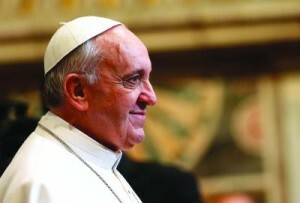 Expressing his desire to “think with the Church,” he said the Church was not just the hierarchy, but the people of God. The mission of the Church was to “heal wounds and warm the hearts of the faithful”, Pope Francis suggested and he also compared it to a field hospital after battle. There was no point asking a seriously injured person about his cholesterol or blood sugar levels. “You have to heal his wounds. Then we can talk about everything else.” This healing had to begin from the “ground up”, he added. Elsewhere he said, “The Church sometimes has locked itself up in small things, in small-minded rules. The most important thing is the first proclamation: Jesus Christ has saved you.” Ministers of religion must be neither too rigid nor too lax, but accompany people with mercy. The Pope warned that the Church needed to be pastoral, reaching out to all people in need. If there was not this “new balance”, the “moral edifice” of the Church would collapse like a house of cards. Its priority, he said, was to proclaim the “saving love of God.” In this, the role of women, which needed to be investigated more, was also essential. “The feminine genius is needed wherever we make important decisions,” he added.